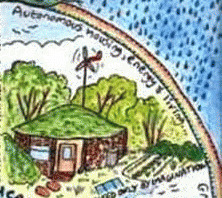 Permaculture is a design method and set of techniques for creating a sustainable and resilient human habitat within a larger ecosystem. It utilizes Nature's Wisdom in the development and maintenance of a sustainable and equitable food supply and a resilient human habitat upon a thriving planet. * Take Care of the Earth: Provision for all life systems to continue and multiply. This is the first principle, because without a healthy earth, humans cannot flourish. - Take Care of the People : Provision for people to access those resources necessary for their existence. - Share the Surplus : Healthy natural systems use outputs from each element to nourish others. We humans can do the same. By governing our own needs, we can set resources aside to further the above principles. "Permaculture is applied common sense;" according to Lisa Fernandez, who is the organizer of the Portland Maine Permaculture Meetup. She believes that the observation and imitation of nature's own patterns for providing for all creatures that permaculture teaches makes good sense. She sees the growing interest in permaculture as a positive response to peak oil and climate change. Permaculture has evolved from being a contraction of permanent agriculture to permanent culture beyond gardening and farming to allow humanity to continue as an ongoing species within the larger whole of this earth. Lisa feels that one resource we have in unlimited quantity is human creativity which we can unleash in service to the earth. She also emphasizes that we need fortitude to overcome the fear of the future and the current struggle simply to feed our families and keep a roof over our heads that can hold us back. We need to "change our story" about need for unlimited economic growth. We also need to recreate a story that involves being in transactional relationship with our neighbors. We need to redefine abundance from stores full of stuff to communities within which neighbors can provide for one another. Challenged to envision a future in which permaculture principles and practices would be deeply embedded, life would be at a village scale. Lisa envisions food embedded in the landscape everywhere, people working together, more appropriate scaled technology like power generation, a healthier human and ecological environment, a sense of belonging to our community and our place, and a culture more worthy of our handing along to our descendents. Lisa suggests that we need to develop a whole new language and paradigm that is based on the thesis that "We are nature and nature is us." We need to see humanity as a "keystone species" embedded within a whole ecosystem of creatures and elements. Clearly humanity has attributes that enable us to have a disproportionately large impact on the world around us, so it is up to us to make that impact positive rather than negative.